Glitzy Dubai is the United Arab Emirates' holiday hot spot. This city of high-rises and shopping malls has transformed itself from a desert outpost to a destination du-jour, where tourists flock for sales bargains, sunshine, and family fun. Dubai is famous for sightseeing attractions such as the Burj Khalifa (the world's tallest building) and shopping malls that come complete with mammoth aquariums and indoor ski slopes. But this city has many cultural highlights and things to do, as well as all the glamorous modern add-ons. Take a wander around the Bastakia district, and you'll discover the Dubai of old, then cruise along Dubai Creek in a traditional dhow, and you'll soon realize there's more to this city than its flashy veneer. Learn more about the best places to visit with our list of the top attractions in Dubai. Dubai's landmark building is the Burj Khalifa, which at 829.8 meters is the tallest building in the world and the most famous of the city's points of interest. For most visitors, a trip to the observation deck on the 124th floor here is a must-do while in the city. The views across the city skyline from this bird's-eye perspective are simply staggering. The slick observation deck experience includes a multimedia presentation on both Dubai and the building of the Burj Khalifa (completed in 2010) before a high-speed elevator whizzes you up to the observation deck for those 360-degree views out across the skyscrapers to the desert on one side and the ocean on the other. Nighttime visits are particularly popular with photographers due to Dubai's famous city-lights panoramas. Buy your Burj Khalifa "At the Top" Entrance Ticket in advance to avoid long line-ups, especially if you are planning to visit on a weekend. Back on the ground, wrapping around the Burj Khalifa, are the building's beautifully designed gardens, with winding walkways. There are plenty of water features including the Dubai Fountain, the world's tallest performing fountain, modeled on the famous Fountains of Bellagio in Las Vegas. Dubai Mall is the city's premier mall and provides entry to the Burj Khalifa, as well as the Dubai Aquarium. There is also an ice-skating rink, gaming zone, and cinema complex if you're looking for more entertainment options. The shopping and eating is endless, and there are nearly always special events such as live music and fashion shows within the mall. The most famous of these are the annual Dubai Shopping Festival in January and February and the Dubai Summer Surprises Festival in July and August. Dubai's excellent museum is housed in the Al-Fahidi Fort, built in 1787 to defend Dubai Creek. The fort's walls are built out of traditional coral-blocks and held together with lime. The upper floor is supported by wooden poles, and the ceiling is constructed from palm fronds, mud, and plaster. In its history, the fort has served as a residence for the ruling family, a seat of government, garrison, and prison. Restored in 1971 (and again extensively in 1995), it is now the city's premier museum. The entrance has a fascinating exhibition of old maps of the Emirates and Dubai, showing the mammoth expansion that hit the region after the oil boom. The courtyard is home to several traditional boats and a palm-leaf house with an Emirati wind-tower. The right-hand hall features weaponry, and the left-hand hall showcases Emirati musical instruments. Below the ground floor are display halls with exhibits and dioramas covering various aspects of traditional Emirati life (including pearl fishing and Bedouin desert life), as well as artifacts from the 3,000- to 4,000-year-old graves at Al Qusais archaeological site. The Bastakia Quarter (also known as the Al-Fahidi neighborhood) was built in the late 19th century to be the home of wealthy Persian merchants who dealt mainly in pearls and textiles and were lured to Dubai because of the tax-free trading and access to Dubai Creek. Bastakia occupies the eastern portion of Bur Dubai along the creek, and the coral and limestone buildings here, many with walls topped with wind-towers, have been excellently preserved. Wind-towers provided the homes here with an early form of air conditioning — the wind trapped in the towers was funneled down into the houses. Persian merchants likely transplanted this architectural element (common in Iranian coastal houses) from their home country to the Gulf. Lined with distinct Arabian architecture, the narrow lanes are highly evocative of a bygone, and much slower, age in Dubai's history. Inside the district, you'll find the Majlis Gallery, with its collection of traditional Arab ceramics and furniture (housed in a wind-tower) and the Al Serkal Cultural Foundation, with a shop, cafe, and rotating art exhibitions (located in one of the historic buildings). Sheikh Saeed Al Maktoum was the Ruler of Dubai from 1921 to 1958 and grandfather to the current ruler. His former residence has been rebuilt and restored as a museum that is a fine example of Arabian architecture. The original house was built in 1896 by Sheikh Saeed's father, so he could observe shipping activity from the balconies. It was demolished, but the current house was rebuilt next to the original site, staying true to the original model by incorporating carved teak doors, wooden lattice screens across the windows, and gypsum ventilation screens with floral and geometric designs. Thirty rooms are built around a central courtyard with wind-tower details on top. Inside are the exhibits of the Dubai Museum of Historical Photographs and Documents, with many wonderful old photographs of Dubai from the period between 1948 and 1953. The marine wing of the museum has photos of fishing, pearling, and boat building. Throughout the building there are many letters, maps, coins, and stamps on display showing the development of the Emirate. Nearby is the Sheikh Obaid bin Thani House, restored with displays of traditional interiors. Dubai Creek separates the city into two towns, with Deira to the north and Bur Dubai to the south. The creek has been an influential element in the city's growth, first attracting settlers here to fish and pearl dive. Small villages grew up alongside the creek as far back as 4,000 years ago, while the modern era began in the 1830s when the Bani Yas tribe settled in the area. 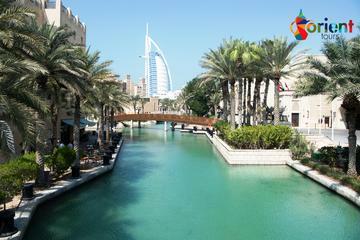 The Dhow Wharfage is located along Dubai Creek's bank, north of Al-Maktoum Bridge. Still used by small traders from across the Gulf, some of the dhows anchored here are well over 100 years old. You can visit here, watching cargo being loaded and unloaded on and off the dhows. Dhow workers often invite visitors onto the vessels for a tour, where you can gain insight into the life of these traditional sailors. Many of the dhows here travel onward to Kuwait, Iran, Oman, India, and down to Africa's horn. This tiny remnant of Dubai's traditional economy is still a bustling and fascinating place to wander around. On the Bur Dubai side of the creek, rubbing up against the Bastakia neighborhood, the waterfront has been regenerated as the Al Seef district, with a waterfront promenade backed by traditional coral-block and limestone buildings, a floating market, and shops selling crafts. It's a great place for a stroll with excellent water views. Jumeirah Mosque is considered by many to be the most beautiful of Dubai's mosques. An exact copy of Cairo's Al-Azhar Mosque, which is eight times its size, the Jumeirah Mosque is a fine example of Islamic architecture. This stone structure is built in the medieval Fatimid tradition, with two minarets that display the subtle details in the stonework. It is particularly attractive in the evening when lit with floodlights. The Sheikh Mohammed Bin Rashid Centre for Cultural Understanding (which also runs a program of tours, lectures, Arabic classes, and cultural meals) organizes guided tours of the mosque designed to try to foster a better understanding of the Muslim faith. Tours begin at 10am daily, except Fridays. Deira lies on the northern bank of Dubai Creek, and the winding streets here unveil the melting pot of different nationalities that have come to call Dubai home. On the shore, ancient dhows load and unload with modern banks, hotels, and office buildings as a backdrop. For travelers, Deira is most famous for its traditional souks (markets), which bustle with shoppers at all times of the day. Deira Gold Souk is world-renowned as the largest gold bazaar in the world. The Deira Spice Souk sells every imaginable spice, with stalls overflowing with bags of frankincense, cumin, paprika, saffron, sumac, and thyme, as well as the fragrant oud wood, rose water, and incense. The fish market provides a much less touristy experience. While in the district, culture lovers shouldn't miss two of Deira's finely restored architectural gems. Heritage House was built in 1890 as the home of a wealthy Iranian merchant and later became the home of Sheik Ahmed bin Dalmouk (a famous pearl merchant in Dubai). Today, it's a great chance to see the interior of a traditional family home. The Al-Ahmadiya School, constructed in 1912, is the oldest school in Dubai and is now a museum of public education. Sitting slap-bang between Dubai's older neighborhoods clustered around the creek and the city's modern sprawl, this ginormous 150-meter-high picture frame is one of Dubai's latest sights. Inside, a series of galleries whisk you through the city's history and explore Emirati heritage before you travel up to the Sky Deck, where there are fantastic panoramas of both old and new Dubai to be snapped on the viewing platforms. Afterwards check out Future Dubai gallery, which imagines what a futuristic vision of the city will look like. Sheikh Zayed Road is the main thoroughfare running through Dubai's modern downtown business district. This wide, eight-lane highway is rimmed with towering glass, chrome, and steel high-rises along its entire length. It's one of the best on-the-ground vantage points for Dubai's famed skyscraper views. Main attractions are along, or just off, the strip between the roundabout and the first intersection, and most of Dubai's famous malls are located along the road's route. The Dubai World Trade Tower has an observation deck on its top floor, which offers visitors panoramic views (a cheaper option than the Burj Khalifa), and the Gold and Diamond Park (Sheikh Zayed Road) is a one-stop shop for jewelry lovers, with 118 manufacturers and 30 retailers all under one roof. Dubai's architectural, cultural, and maritime heritage is showcased at the Heritage and Diving Village, with displays related to pearl diving and dhow building — two of old Dubai's historic economic mainstays. There are also recreations of traditional Bedouin and coastal village life, with Persian homes, a traditional coffeehouse, and a small souk where potters and weavers practice their handicrafts at the stalls. Local music and dance are performed from October to April, and visitors can get advice from practitioners of traditional medicine. One of the city's top tourist attractions, the Dubai Aquarium houses 140 species of sea life in the huge suspended tank on the ground floor of the Dubai Mall. As well as free viewing from the mall, if you enter the Underwater Zoo, you can walk through the aquarium tunnels. Different activities help you get a closer look at the sea life. Glass bottom boat tours (on top of the tank) are particularly popular. Cage snorkeling and shark diving activities are also on offer. The Burj Al-Arab is the world's tallest hotel, standing 321 meters high on its own artificial island on the Dubai coastline. Designed to resemble a billowing dhow sail, the exterior of the building is lit up by a choreographed, colored lighting show at night. Decadent in every way possible, the Burj Al-Arab is one of the most expensive hotels in the world, with the most luxurious suites costing more than $15,000 for one night. For those without unlimited credit, the way to experience the over-the-top opulence is to go for dinner at the underwater Al-Mahara restaurant, where floor-to-ceiling glass panels in the dining room walls allow you to view sea life while you eat, or you can enjoy lunch at California-style fusion restaurant Scape. For the ultimate panoramic views over the city, book afternoon tea at the Skyview Bar (a minimum spend is required) on the 27th floor. This strip of sandy white bliss is the number one beach destination for Dubai visitors. Hotels are strung out all along its length, with this being one of the most popular places to stay for tourists. The beach has excellent facilities, with plenty of sun loungers, restaurants, and water sports operators offering jet skiing. While in the area, brush off the sand for an hour and visit the Majlis Ghorfat Um Al-Sheef, just a short hop from the beach. Built in 1955, this was the summer residence of the late Sheikh Rashid bin Saeed al-Maktoum. The residence, made out of gypsum and coral-block, has been restored and maintains much of the original beautiful decor, giving you a better understanding of the opulent lifestyle of Dubai's rulers. The Majlis Gardens feature a reproduction of an impressive Arab irrigation system and many shady date palms. You don't have to go too far away from the skyscrapers to soak up a more natural vista. The Ras Al Khor Wildlife Sanctuary incorporates the mangrove forests and wetlands of Dubai creek. An important stop-off on the migration routes, it's a prime place to spot flamingos in winter when massive flocks of these majestic pink birds wade through the lagoons, backdropped by soaring high-rises. Various hides in prime spots have been set up within the park to allow bird-watchers good views of the bird life. This museum explores the United Arab Emirates' historic role as a trading center between Asia, Africa, and Europe long before oil became this region's most prominent industry. Located inside the old residence of Sheikh Hashr bin Maktoum Al Maktoum, who was a member of Dubai's ruling family, the exhibits trace this coastal area's history as part of the global trade routes, with displays of artifacts and manuscripts. Also on-site is the Rare Books and Manuscripts Museum and the small Armory Museum. Mall of the Emirates is one of the city's most famous malls, with the spectacular (and surreal) Ski Dubai facility inside. The indoor ski slope is complete with chairlifts and a penguin enclosure, all at a continuous temperature of -4 degrees Celsius. There's also a cinema complex and a family entertainment center with a whole host of rides aimed at both the big and small. The shopping opportunities are boundless, as are the eating options, offering every conceivable world cuisine. This theme park, near Global Village, is immersive entertainment at its finest and has thrills and spills for both kids and big kids. With one zone devoted entirely to Marvel's iconic characters; another to dinosaur-themed rides; and a zone where the Cartoon Network takes the helm, with gentler rides and activities for younger children, there's something here for every age. Whether you want to help the Avengers battle Ultron, scare yourself silly in a haunted house, or join Spider-Man as he swings through the city, this is heaven for families looking for a fun-filled day out. For nighttime attractions, look no further. Opened in mid-2016, Dubai's classy new opera building is the centerpiece of the waterfront Opera District in downtown Dubai and set to become the city's major cultural hub and main entertainment venue. The Dubai Opera hosts a year-round program of famous musical theater productions, concerts by world-class musicians, opera, ballet, and classical music, as well as smaller productions, comedy nights, and concerts. The 2,000-seat theater building itself is an astonishing piece of architectural mastery and one of Dubai's new landmarks, with its highly-contemporary glass and steel walls jutting out over the waterfront, built to resemble the curves of a traditional dhow. This long stretch of white-sand beach, south of Jumeirah beach, isn't just a top destination for sunbathers looking to lap up a lazy day of swimming and soaking up the rays on the sand. Kite Beach is renowned as Dubai's premier destination for kitesurfers and is home to an array of water sports operators. This is where you come to get out on the water kitesurfing or try your hand at stand up paddleboarding, with equipment hire and lessons all easily arranged on the beach. Part of the old Al Quoz industrial district, centered on Alserkal Avenue, has been regenerated to become Dubai's main arts hub and is home to some of the city's most important contemporary art galleries. Established gallery names such as the Green Art Gallery, The Third Line, and the Ayyam Gallery have made their home here, while a host of smaller gallery start-ups have also moved in. The district's program of rotating collections focuses both on the work of major artists, as well as highlighting new Middle Eastern talent. This emerging district is also the place to come for fashion and accessory boutiques by local designers, pop-up restaurants, and café life, and it showcases the energetic and youthful buzz of a city, which is usually more noted for its corporate face. At Dubai Parks and Resorts, your entertainment needs are all rolled together into one location. The only problem here is choosing what you want to do. This mammoth project incorporates a swag of world-class theme parks providing something for everyone, whatever your age. Motiongate takes its theme from Hollywood productions, with rides based around movie blockbusters; Bollywood Parks brings the world of India's famous movie industry alive on its rides; and Legoland Dubai and Legoland Waterpark provide younger visitors with a fun-packed day out on its interactive rides, water slides, and wave pool. The district's attached Riverland Dubai dining hub means that there's no need to leave after you've exhausted yourself with theme park pursuits, as there's plenty of evening entertainment here as well. This waterpark, based at Atlantis, The Palm on the Palm Jumeirah — Dubai's famous man-made island development — is a great place to cool off after a few days of hectic shopping and sightseeing. The waterslide action here is excellent and world-class, with the Aquaconda, the world's longest water slide; a nine-story-tall slide, aptly named the Leap of Faith; and water coaster rides. There's also underwater safaris using Sea TREK helmets; a dedicated water play area for smaller children with slides; and for when all your energy has been used up, a 700-meter sweep of white-sand beach. This is the zaniest garden ever. Not content with constructing the world's largest buildings and malls, Dubai has created the world's largest flower garden, spanning 2,000 square meters and home to a reputed 100 million flowers. Everything that can be covered with flowers has been, from twee English-style cottages to windmills and trucks. There's even a flower version of the Burj Khalifa. Stroll the walkways and enjoy the riot of color and the wacky flower displays. Escape the city's skyscrapers for an afternoon here. For a slice of nature, this vast butterfly garden, with around 15,000 butterflies flitting under the domed enclosures, can't be beaten. It's a great chance for kids to get close-up views of butterflies as they often land on visitors' shoulders and hands. There's a museum here, too, with plenty of information on butterfly varieties, their habitats, and life cycle. As well as Dubai's glut of theme parks, a stay in the city can incorporate plenty more active things to do. There are plentiful desert tours, which head out beyond the skyscrapers if you want the kids to sample more natural scenery. 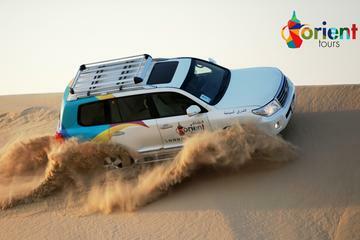 Many of the tours include sand boarding or camel riding. To stick to the coast, the beaches and resorts offer kayak hire, as well as a bundle of other water sports to get the kids working off some energy in the sea. And for those who enjoy the complete oddity of having some snow-fun amid the heat, the indoor ski run at Mall of the Emirates can't be beaten. Luxury Hotels: Blending luxury with a handy location, The Palace Downtown Dubai lies within walking distance of the Burj Khalifa, Dubai Mall, the Dubai Fountain, and the Souk Al Bahar. Also in Downtown Dubai, the Armani Hotel resides in the Burj Khalifa itself and ensconces guests in sophisticated elegance. For those seeking luxury on the water, the exquisite sail-shaped Burj Al Arab Jumeirah is a Dubai icon and one of the most luxurious hotels in the world. Mid-Range Hotels: A 10-minute walk from the Burj Khalifa and Dubai Mall, Ramada Downtown Dubai is a popular mid-range option, as is the boutique Manzil Downtown Dubai with a modern Arabesque design. About a 12-minute drive from the Burj Khalifa, the Sofitel Dubai on Jumeirah Beach sits on Dubai's most famous promenade, "The Walk," and lies just across from "The Beach," a waterfront leisure precinct packed with shops and restaurants. Budget Hotels: If you're watching your wallet, a popular budget hotel option is Ibis Mall of the Emirates, next door to its namesake mall with Ski Dubai. It's also close to a metro station and about 13 minutes by car to Burj Khalifa. Also near a metro station, the Ibis Al Rigga is closer to the international airport. If you're seeking a more historic feel, the XVA Art Hotel offers excellent value in the heart of Bastakia (Old Dubai). See the Sights: One of the easiest and most convenient ways to see the city is on a Dubai City Half Day Sightseeing Tour. This guided tour takes you by coach to the main attractions, including Jumeirah Mosque, Bastakiya (the old quarter), the Spice Souq, Deira Gold Souq, and more. For a more in-depth tour that combines the city and desert, try the two-day Super Saver: City Sightseeing Tour and Desert Safari. Spend the first afternoon seeing the sights of Dubai and the second afternoon and evening on a desert safari, including a camel ride, sand boarding lessons, a sunset barbecue, and a belly dancing show. Take a Flight: For incredible views over the city and surroundings, take a 15-minute or 25-minute Helicopter Flight over Dubai. There is no better way to see the famous Palm Jumeirah or the manmade archipelago created in the shape of a world map, known as The World, than from the air. Beyond Dubai: To dive into the UAE's other cities, check out our articles on things to do in Abu Dhabi and Sharjah. If you want to learn about the beach resorts beyond Dubai, have a look at our feature pieces on Ras Al Khaimah and Ajman.